Today I decided what my next culinary challenge will be, but the recipe calls for raisins and I've decided to omit them. Then it got me thinking about desserts I don't like (which is strange, because usually I talk about food I like :P). 1)Desserts with raisins in them - it doesn't matter what it is, even if they try to conceal them! You eventually find it, chew on and it, and bleeeeh. Dessert is ruined. This is especially the case for Oatmeal Raisin cookies (or any other cookies that have raisins in them) and cinnamon buns with raisins hidden in between each successive rolled layer. the raisin has shrivels, dries up (more than it was before, if that's even possible) and so is this hard thing that you bite into...and tastes terrible. the raisin soaks up lots of juice. It's like the raisin is trying to revert back to grape form, but it fails. So it's just kinda unpleasant and gross. If I wanted grapes, I would eat grapes. Retrieving them is not so fun either...for your hands get really sticky. As a child, Jello was my last resort dessert. If it was the only thing left at the buffet, that's what i'd have. I even had difficulty eating it when the doctor told me (in the event of stomach illnesses). It's not really the taste (which is for the most part sugar and artificial fruit flavoring), it's the texture. And that leads me to the friends of Jello. Not that they necessarily have gelatin in them, but they have a similar texture. apart from ground cassava used in west african food (which I really like), this was my only other exposure to cassava. I had it 5 years ago while visiting a person's place. Perhaps it's because it didn't have a cakey texture at all. I can't even really describe the taste...I just know eating it wasn't fun. b) These little glutinous rice cupcakes? 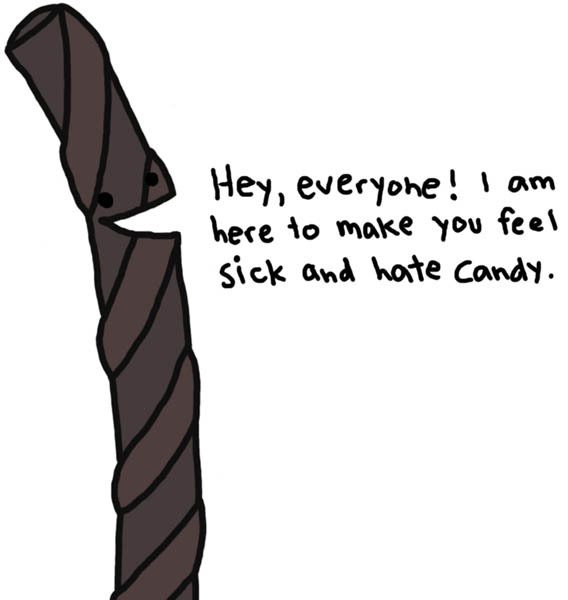 All types, but especially black licorice. Apart from the dessert I will name next, it's the nastiest thing I've ever tasted. I'm talking about that one that plagues grocery stores at Christmas and for some strange reason is often part of wedding cakes (I've been told it's for stability purposes, especially when it has columns supporting each layer). Whatever fruit is in there does not resemble fruit anymore - in shape, taste or texture. Even the surrounding cake tastes like pure elemental nastiness. The only one that's even slightly tolerable is the one that only has cherries in it or the jamaican fruit cake (it also doesn't have those yucky alien fruit in them). But ok, I've asked many friends if they like fruit cake and they all don't. Clearly, there's a market for it...I've noticed that it's always parents that like them. My parents do, my friends parents. So I'm wondering: is there a point in time where people suddendly like fruit cake? Like, do you have kids and then like it? I'd like to know and try to prevent this from happening. I think that's all I can think of for now. If you have any other gross desserts, please name em :) I'm curious. i agree with you about the raisins and the licorice, eurk. one dessert which i am sure is delicious, but not for me: cheesecake. I must say that I have to disagree with you on a couple of things. Maybe I'm just weird. 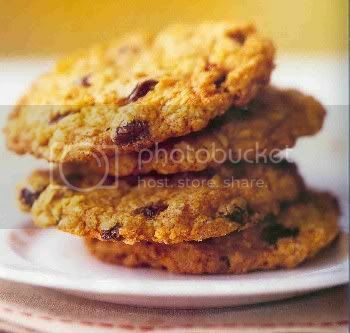 The oatmeal raisin cookie works if the cookie is really soft. Then the raisin adds a contrast (if that's proper word to describe food) in texture with its chewiness. 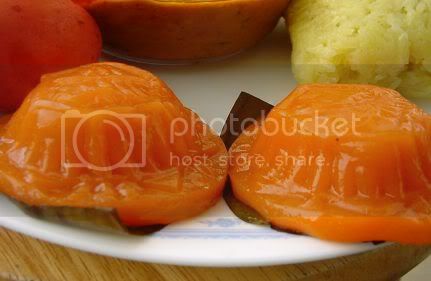 Filipino gelatinous rice cakes (kutsinta) are awesome. You should try the ones they sell at the Filipino bakery on Victoria and Van Horne.